The RCV Performance Products Ultimate Dana 44 Rear Axle Set for Jeep JK is manufactured with 300M alloy steel for ultra-high strength, stiffness, and high shock resistance. The axle shafts are specially designed for rock crawling and other high stress off road applications. RCV uses 300M steel for several reasons; High metal strength enables axles to transmit extremely high torque loads without shaft breakage. RCV 300M rear axle shafts are proven to be 2.5 times stronger than original equipment axle shafts. The high ductility of 300M prevents axle shaft fracture by absorbing large shocks loads, such as when the vehicle’s wheels are spinning and suddenly gain traction, or the vehicle is bouncing as the wheels are spinning. Shock passed onto other driveline components, including the differential, is also reduced. Further, the stiffness of 300M prevents the axle shafts from bowing, and thereby bending at the flange. The RCV Ultimate Dana 44 Rear Axle Set is currently available for ’07 and newer Jeep Rubicon and Unlimited, and is offered in 32 or 35 spline, and 5×5 or 5×5.5 bolt pattern versions. 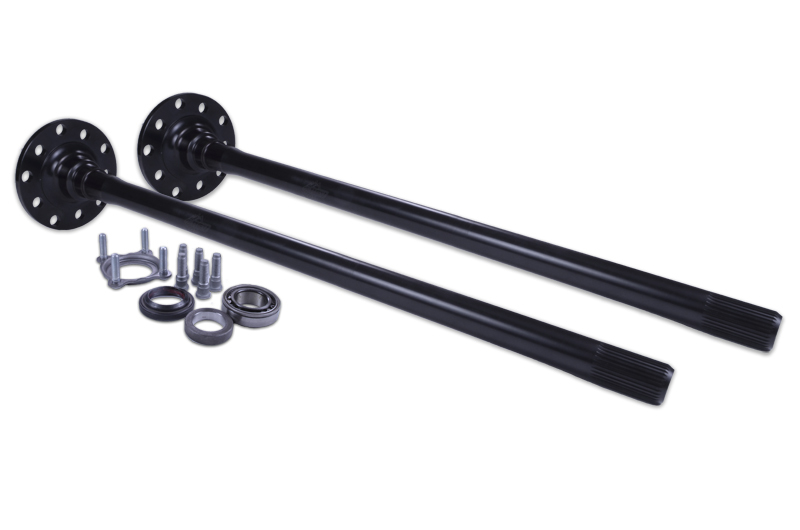 The axle set includes left and right rear axle shafts, and associated hardware. Made in the USA. For more information visit www.rcvperformance.com, or call (815) 877-7473.